We recommend checking out our discussion threads on the NewTek TriCaster 8000 FG-000036-R001, which address similar problems with connecting and setting up Production Switchers NewTek. The user manual for the NewTek TriCaster 8000 FG-000036-R001 provides necessary instructions for the proper use of the product Professional Video - Studio & EFP Equipment - Production Switchers. The NewTek TriCaster 8000 is an 8-camera input, tightly integrated hardware and software solution for streaming video online and for producing live events. 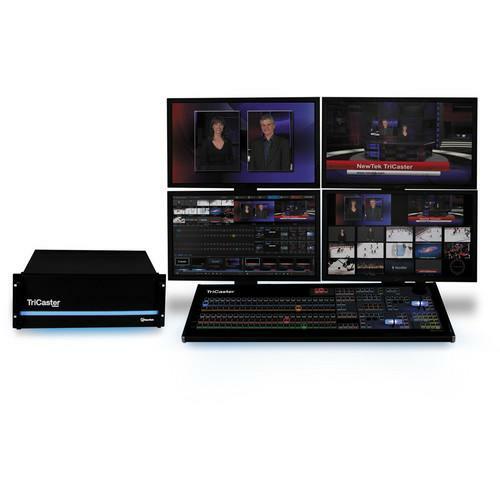 The TriCaster comes with an appropriate control surface and with a powerful user interface. Altogether the package offers built-in multi-track ISO recording with broadcast, projector, and online output options, completely customizable visuals, powerful 3D effects, video playback, graphics, transitions, virtual sets and more. Digital and analog outputs are available for streaming to broadcast machines, to live projectors, and to video routers. You can also connect to a network by Ethernet and stream videos directly to the web. At the same time, you can store files to very high-capacity internal and external drives. The 8000 is a 4RU device designed for large-scale, multi-camera production in native full-resolution HD. Box Dimensions (LxWxH) 25.0 x 24.0 x 13.0"
The user manual for the NewTek TriCaster 8000 FG-000036-R001 can be downloaded in .pdf format if it did not come with your new production switchers, although the seller is required to supply one. It is also quite common that customers throw out the user manual with the box, or put the CD away somewhere and then can’t find it. That’s why we and other NewTek users keep a unique electronic library for NewTek production switcherss, where you can use our link to download the user manual for the NewTek TriCaster 8000 FG-000036-R001. The user manual lists all of the functions of the NewTek TriCaster 8000 FG-000036-R001, all the basic and advanced features and tells you how to use the production switchers. The manual also provides troubleshooting for common problems. Even greater detail is provided by the service manual, which is not typically shipped with the product, but which can often be downloaded from NewTek service. If you want to help expand our database, you can upload a link to this website to download a user manual or service manual, ideally in .pdf format. These pages are created by you – users of the NewTek TriCaster 8000 FG-000036-R001. User manuals are also available on the NewTek website under Professional Video - Studio & EFP Equipment - Production Switchers.